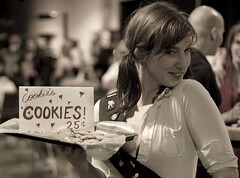 Cookies being offered by a lovely young woman at the Anime North convention. Yummie! Holy Cow! !....Girl Scouts were not like that when I was in Boy Scouts!! How many cookies did you buy, Dave?